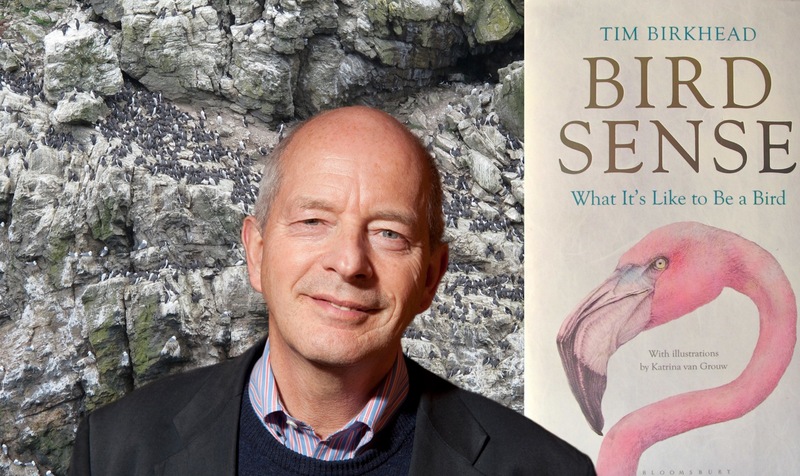 The behaviour of birds has always been a source of amazement but the sense of wonder was taken to an even higher level during Tim Birkhead's magisterial talk on March 2nd. As an example, he recalled how an incubating guillemot on the island of Skomer, in west Wales, stood up from its egg and recognised its partner - many hundreds of yards away - flying towards the colony after it had been away for several months. It seemed they can see far better than humans and have an acute recognition system. Tim, who is Professor of Behaviourial Ecology at Sheffield University, pointed out that the received wisdom of birds being summed up as a "wing guided by an eye" is only part of the story. Astonishing eyesight is just one of the six senses that birds possess, including a magentic sense for helping direct them, when migrating, to the precise place where they were born. Recent research suggests that two separate processes are at work - a chemical mechanism based in the eye provides the compass, while magnetite receptors in the beak provide the map. Other senses are evident with barn owls, which have huge ear openings. Although they use night vision for navigation, they rely on sound to locate their prey, whilst guillemots also have a highly developed sense of hearing so they can discern their offspring among colonies numbering tens of thousands. Relatively recently, researchers were persuaded that birds have a sense of smell, as seen with petrels, which seem to navigate apparently featureless oceans - but which are, in fact, overlain with "odour-landscapes", Kiwis, which also hunt in the dark, have tiny (virtually useless) eyes, but long sensitive bills and highly developed nostrils to help them detect earth worms buried deep in the mud. Similarly, complex sense receptors in ducks’ bills allow these birds to sift food from gravel when dabbling. Some of the research Tim described was extraordinary, involving adapting clear and frosted contact-lenses for robins, in order to test their ability to orientate. But although Tim told us scientists now have a good basic understanding of some of the senses of birds, there is still a large amount of research to be done. Much of this work could focus on birds experiencing "emotion". Tim pointed out that birds separated for some time appear to show signs of affection in the protracted tactile greeting ceremonies they perform when reunited - but he wondered exactly what this means. It has been suggested that swifts perform some of their spectacular aerobatics for no discernible practical reason - but simply for the pleasure of doing so. Yet how is this tested? For his part, Tim concluded that birds do experience emotions, but added the important rider that we may never know whether they do so in the way that humans do – or indeed ever really know what it’s like to be a bird. "I knew that the behaviour of birds was extremely sophisticated but I had no idea just how advanced it is - until I heard Tim's talk. From start to finish, it was a totally compelling presentation, which made everybody gasp with astonishment as the findings of the latest research were revealed. It seems nothing short of miraculous that a bird born in a barn in Oxfordshire can fly back from Africa and find the exact same nesting-place. And yet Tim's explantion of how it happens threw light on this amazing journey, plus much else - and it made for a totally brilliant evening" - Roger Brooks, Chipping Norton.